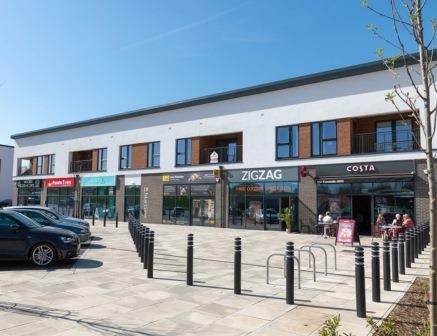 There is a new 11,500 sq.ft Asda food store along with six new retail units of approximately 1,000 sq.ft each, a day nursery, care home and pub restaurant. The six units that Patrick Punch & Co have let benefit from a 100 space car park and a variety of different uses ranking from A1 retail, A2 professional services, A3 restaurants & cafes and A5 Hot Food Takeaway. Two of the units are high quality A5 Hot Food Takeaway’s, one a dry cleaners, one a hair salon, one a charity shop and the last unit is a Costa Coffee. The day care nursery site has outline planning consent for D1 and extends to 0.4 acres – please contact us for further details on this. The pub/restaurant site extends to 0.76 acres and benefits from outline consent for A4 – please contact us for further details on this site.